Biovision is dedicated to providing veterinary practitioners with quality, innovative products that are cost effective and enable better patient care. Biovision’s product line is composed of technologically advanced, ultra-portable systems and accessories tailored for cutting-edge visualization applications. All Biovision-branded products are designed and produced to the highest level of quality and reliability. The core elements of Biovision Veterinary Endoscopy’s product line are the SurgView™ Xenon Imaging System, the SurgAssist™ Insufflator/Electrosurgical Generator, and the patented NeedleView™ scope. These innovative systems combine all of the features needed for diagnostic and minimally invasive surgical procedures in a comprehensive and ultra-portable package for your clinical practice. Single port procedures — developed by Biovision — significantly reduce the learning curve for rigid endoscopy. 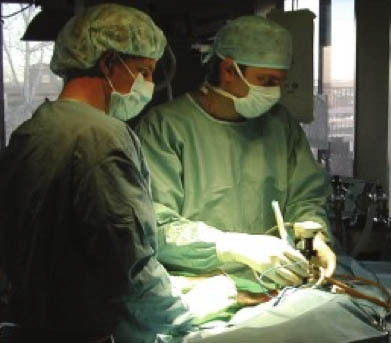 An experienced surgeon will provide you with a minimum of 8 hours of hands-on surgical instruction. We sponsor numerous domestic and international minimally invasive surgical and diagnostic CE courses.